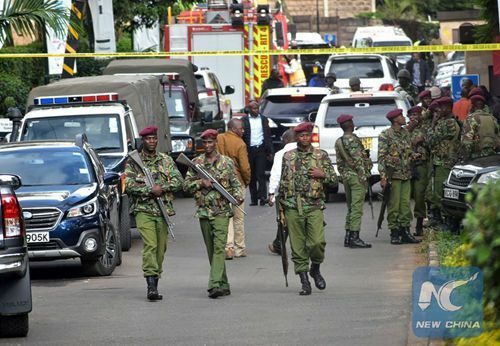 Kenyan police said they have intensified security operations across the east African nation to pursue the perpetrators of the Nairobi hotel attack in which 21 people were killed and several others injured. Police spokesman Charles Owino also circulated photos of eight suspects believed to have planned the attack on the luxury hotel and business complex. "We are appealing to members of the public to be on the lookout and report to the nearest security agency should they see any of the persons whose photos appear therein," Owino said in a statement issued on Sunday evening. According to Owino, the police believe the suspects are making efforts to fraudulently acquire Kenyan identities. Somali terror group al-Shabab claimed responsibility for the attack on last Tuesday inside dusitD2 Hotel, part of a Thai-owned international chain that appeared to be the chief target of the attackers. The militant group claimed the Nairobi attack was a response to the "witless remarks" of U.S. President Donald Trump and his declaration of Jerusalem as the capital of Israel, and to the "systematic prosecution of Muslims in Palestine."